When we first moved to Miami we were excited to realize that there are no fast food places near us. They are literally miles away, and over the toll bridge, making them inconvenient to go to. And since Averi wasn’t seeing them, she wasn’t asking to go. No more eating bad for you food just so the kid can get a toy! It was great. When we needed something quick we would just stop at one of the numerous walk up restaurant counters or bakeries and get empanadas and croquettes and potato balls. They taste so good and are also just a couple dollars. But it’s been almost two years of living here. And some days you just need grease. And fat. And hot salty fries. And shakes and mcflurries. And those days are Wednesday’s. As I know you know, Wednesday’s are Hebrew school days. I haul Averi and a friend from school to the Temple and then try to kill an hour and half. Which is not enough time to go home. There’s no malls or libraries here. There are some cute stores in the area, but 1) there’s no parking 2) it’s still too hot and humid to walk around and 3) they aren’t cute or practical enough to justify weekly visits. I normally bring a book and sit in the temple lobby, but I don’t really like doing this. There are always obnoxious kids running around. And people keep going into the outside play area, knowing the door will lock on them, and then they pound on the door to try to make you get up and let them in. I don’t like getting up. And three people did it yesterday! I only got up for one though. I let kids run across the lobby the other times to open the door. If there was a fast food restaurant nearby I could sit in air conditioning, drinking a soda, reading my book and ignoring everyone without having to pretending to be nice. And occasionally I might indulge in salty, greasy food. Wishing I was at a fast food restaurant yesterday made me want something meaty and saucy. And quick. Because I had just spent all afternoon sitting at the Temple. Korean Steak it is! I have had this recipe for so long that it predates Pinterest. So I have no clue where it came. The original recipe, and the way I normally make it, has you pair the steak with rice noodles. But I am out of rice noodles, so jasmine rice it is. In some ways it was better, as the rice absorbs more of the sauce. And the sauce is awesome. Little soy, little sambal oelek, little garlic, some citrus. It all melds beautifully together. Since we are in a condo, the other change I make is that I don’t grill skewers the way the recipe recommends. I just use a grill pan. And since it takes all of four minutes to cook, it doesn’t seem worth hassle of grill anyway. Quicker to eat and enjoy! Combine first six ingredients. Add beef and mix well. Marinate at room temp for 30 minutes, turning once. 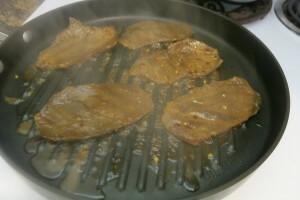 Place steak into grill pan, reserving marinade. Grill steak four approximately 4 minutes per side, until desired degree of doneness. 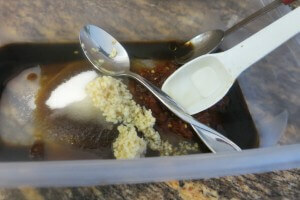 Combine reserved marinade and water into small saucepan. Bring to boil and cook for 1 minute. 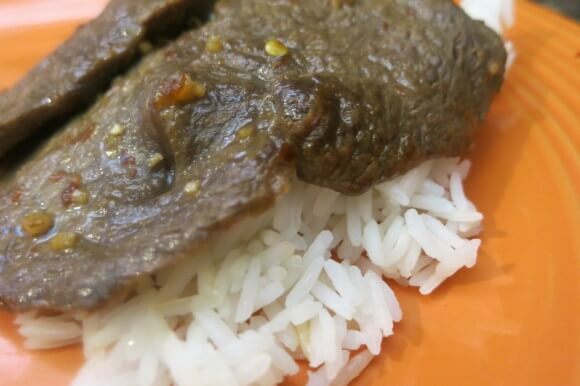 Serve steak over rice, and add sauce.